Discussion in 'Downhill & Freeride' started by c2001, Mar 3, 2008.
black boxxer decals seems to be this years hot item, that and custom boxxer decals. . .
Nice pics from Sven, bike needs some graphics though eh? Wonder how the geo changed? I thought the old geo was pretty spot on. i like it better with the understated graphics. And a gold flake paint job. Anybody else notice that it looks like he is running a spring instead of the air cartridge in the Boxxer? regarding the fork, sven mentioned that this wasn't the fork he'll be running this year. the fork in the feature is an older franken-fork he put together from parts at home until his new one comes in...fyi. Just curious. I am still relatively new to Boxxers. I have the Team and always wonder how much, if any, of an advantage the air is. Air is used for the weight savings and adjustability, and the bling factor of having the latest and greatest fork.....the same on Sam Hill rides. funny how most of us would have scoffed at the mention of them a year or 2 ago...They have the capacity to bring low cost high quality bikes to the market...pretty cool if you ask me. So, there is a $600 price difference between the solo air and the coil boxxer. And there is a $90 price difference between a totem solo air and a coil totem. In both forks the only difference is the spring type. That pricing is just crazy and its making fun of the consumer. cant you get the air spring kit and run it in the team? Is this an episode of Back to the Future? Can we get back on topic of Needles new rig? An acquaintance who works at TF Tuned in the UK says that 90% of WC forks get sent in for a 'coil spring upgrade'. Actually, I would like to learn about Boxxers, but that new frame HAS to come first! Man...my 07 ECD is getting shipped tomorrow, now I feel REALLY outdated! That thing looks light, nimble, and very clean. I think if it were mine, it'd get a stealthy, minimal flaked silver paint job with charcoal graphics. Keep it mellow...which is odd if any of you have ever seen my bikes! I'd like to know the geo. Someone start diggin, I lack the connections! 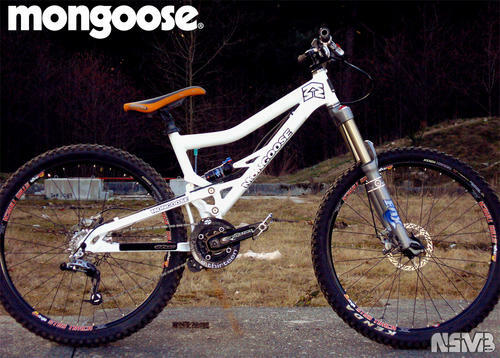 Oh, and yeah, everyone I know laughed at me last summer when I boldly stated that Mongoose WILL become a major contender in 08 and 09, if not one of the top 5. I'm curious and excited to see it happen! Because they're either from a 2002 Boxxer, or the 2002 replica Boxxer alot of the top pro's were running last season. the thing looks like a Unified Rear Triangle design, with some extra pivots...doesn't it feel weird when the bike cycles thru it's travel, having the bottom bracket pivot rearward in relation to the seat/bars??? Heh, I asked that in another thread and got all the mongoose fans telling me I was a hater. Some less rabid mongeese told me you don't feel it move, but it does move. Yeah, that one. I know 1998 is the one replicated but wasn't there red crowns in 2002 also? It's scary like everthing else unknown. There's really not that much that moves once you can physically play with one. I mean, the linkages and stuff MOVE, but in relation to the bars and front triangle? you won't notice. I don't know how to describe it... just buy, steal, or borrow one. If I lived closer I'd gladly let you take mine for a rip. Someone pay my gas and I'll drive it down from SOUTH DAKOTA right now to play! and 1999, 2000, and 2001 as well but they were a brighter shade of red than what was used in 2002. the 1998 oem boxxer used grey polished crowns. Prior to '99 only the factory forks had red crowns and, technically, the red fork legs and crowns on the factory bikes this past season were replicas of the 1997 factory team forks which later became the 1998 fork that the public could buy (minus the red crowns of course). It doesn't travel rearward, remember that the suspension is bottoming too. It doesn't feel like the front end and the BB are separating. I asked this very same question before I bought one, as will everyone else who looks at them curiously! Damnit...Neethling's got a audio "write up" on it on Littermag and even mentions a head angle and toptube length change...then doesn't say what they were! He said that it "fits taller people better" though. I'm assuming that means the Large got a tad longer? It's also an 83mm BB width now. Haha, sorry i'm not very well read in the History of the Boxxer. Lets keep in mind I was 7 at the time. he, as well as many other RS athletes have been running coil sprung Boxxer's for a while. this has been on the forums a bunch, but well spotted. Really? Every race i saw needles at in the US he was running air. is that photographed in front of the remains of a house destroyed in the brush fires? Just got a new Black Diamond Double, only rode it a few times, but so far it rocks! It solid with decent components and the geometry feels like I could ride just about any terrain, but will also take a nice downhill beating. 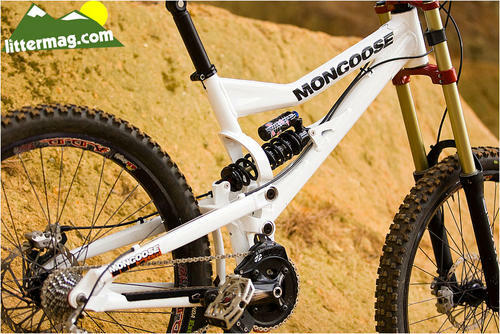 Mongoose has my vote! yes its always a pleasure to explain that this is not a walmart bike to my customers. Don't know any of this stuff yet, or anything about Boxxers at all, actually, but hoping to pick up a WC soon. Is there a "kit" for this conversion? Do I just call RS and tell em I blew the Solo air cartridge and I need the Spring Upgrade? Is it Team parts?